Moist and delicious pumpkin-flavored cake. 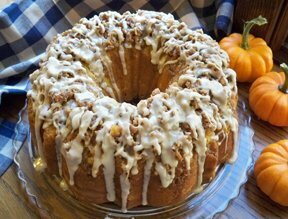 The layers of latte cream cheese give this Bundt cake a hint of coffee flavor that mingles nicely with the pumpkin and goes great with a nice hot cup of coffee. It is a beautiful cake to serve for any special fall or holiday occasion. Watch this video to see how to enjoy your apples this fall by making sweet and delicious caramel apples. Step-by-step instructions from beginning to end on making a homemade pumpkin pie, starting with a fresh pumpkin.